A couple years ago we went to a Thanksgiving cooking class at Red Light which was hosted by their executive chef Jackie Chen. The theme was an Asian inspired T-day menu and this was one of the side dishes. Place on platter and pour bolognese over the top. 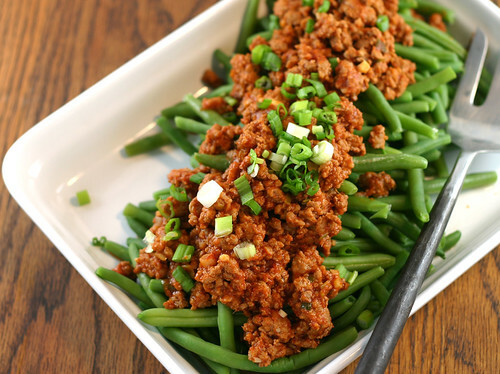 Excellent fusion recipe – I love this Bolognese with the Asian twist and can’t wait to give it a try! Beautiful. Love the flavors of that meat sauce and it’s not only for pasta anymore. Hey Mary, love the side dish. Very unusual combo. I’d bet it tastes wonderful! You should enter it in Reeni’s side dish showdown. This is really an odd recipe but looking at the ingredient list, how bad could it be? Very original and innovative. If it has sriracha in it I know I will love it! Thanks for sharing it Mary. What a pretty dish! I’m not familiar with Sriracha Sauce. I’ll have to Google it. WHat a great idea to put over green beans! A well combined meal. Delicious! Wow! That’s unusual, especially for Thanksgiving! Probably not something the pilgrims included, ya think? I’ll definitely give it a try…..maybe over rice? Never mind, I’ll do the beans….much healthier! These are flavors are wonderful! East meets west equals delicious! Beautiful and delicious! I love the ingredients. I love green beans. This will be perfect for my dinner with rice. This looks wonderful. I will definitely try it! I love the way this looks.. saw it on food with style and went wow!!! The recipe is going in my file as I am crazy about all the ingredients and never put them together!!! 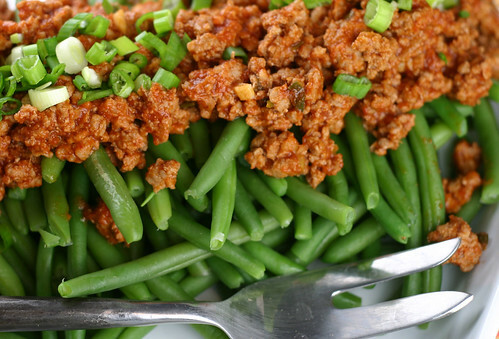 Almost like a popular Szechuan dish to me where they wok-fry long/green beans with minced meat. Very nice dish – great flavor combo and not too difficult. And as always, a beautiful photo. Thanks, Mary! made this tonight, and it was incredible. great way to go carb-free, as well. thanks for the recipe! 🙂 i may just toss some leftovers over some brown rice or soba noodles. yum. SO glad you liked it AND that you told us about it! I think the noodles would be a stellar addition. I was SHOCKINGLY impressed by this recipe. Double thumbs up. FABULOUS! Chef Jackie Chen is amazing at simple, but powerful dishes. Does that mean you made it and ate it? Yes I did. Just updated my blog with it!